Up around 7.30am to pack and get ready to leave the Boardwalk. Its a real shame to have just one night in the grand villa, but it was amazing to stay there, if only for a short while. The luggage is collected by bell services to be moved across to the Contemporary and we are off. 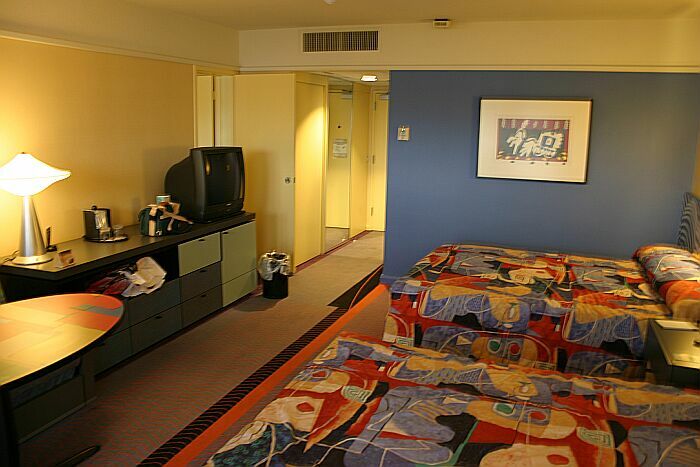 We check-in at the Contemporary around 9.00am. The rooms are not ready at this early stage of the day and Deb is disappointed because we dont get an upgrade after our luck yesterday. 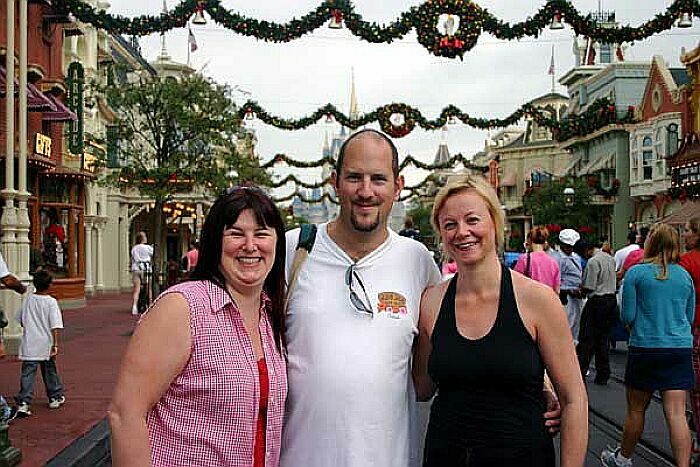 We are in the Magic Kingdom by 9.30am and it is looking resplendent in its Christmas decorations. The first port of call is to see the new Stitch attraction in Tomorrowland. I have to agree with most things Ive seen written about this, it is no real improvement over Alien Encounter. I quite like the Stitch audio-animatronic, but thats not enough to make it a must see attraction. It's always the ugly blokes that pull the best birds! Next is Buzz Lightyear. Deb says she has always ridden with Matt before and he controlled the spinning. Tam and I say she should ride on her own, so she does. At the end we compare scores. Deb wins! Matt and I are suitably embarrassed by being beaten by a girlie (I should be getting used to it by now), although I do have to mention that I finished second. Not that Im gloating in any shape or form. The Carousel of Progress is open and this is one of Debs favourites. Me and Deb clap and sing along at the first rotation, only to be met with disapproving glances from Tam and Matt. We are forced to sit in sullen silence through the rest of the attraction. Spoil sports. On to the TTA where it starts to rain really hard as we glide around. 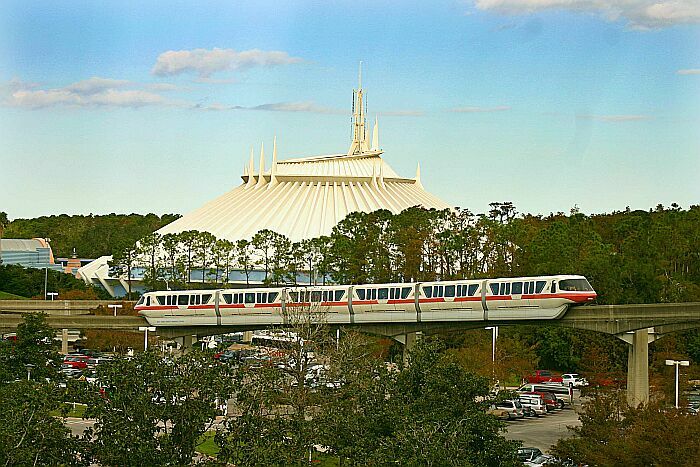 Luckily it has eased off by the time the ride finishes, so we run over to Space Mountain. We ride the left track, which is not something I can recall doing before. As we exit, the sun is shining again. It rains on and off all day, but our luck holds and we miss the heavy downpours every time. Through to Fantasyland where Mickeys Philarmagic is about to start. This is both good and bad news as we have no wait, but have to sit in the very front row. I dont think the 3D effects work so well this close. Peter Pans Flight is next. The lines have been minimal everywhere and this is the longest to date at 10 minutes. We follow a father and young daughter through the line. The girl is probably about 4 years old and not a happy bunny. She struggles in her fathers arms, screaming as loud as she can. When she is put down she refuses to move an inch, so is picked up for another bout of screaming. The last time I saw a tantrum of this magnitude was when Matt thought we had run out of beer. The Haunted Mansion is next and this is still probably my favourite all time WDW attraction. As soon as you walk through the doors you are instantly transported to a world of ghosts and demons. I love it. Lunch is taken at the Columbia Harbour House where a reserved section has just been opened, so we eat in a quiet part of an otherwise crowded restaurant. Deb is getting nervous as we have been in the Magic Kingdom for a few hours and the lack of shopping is beginning to show, so we take in the Christmas shop with the promise of more to come. 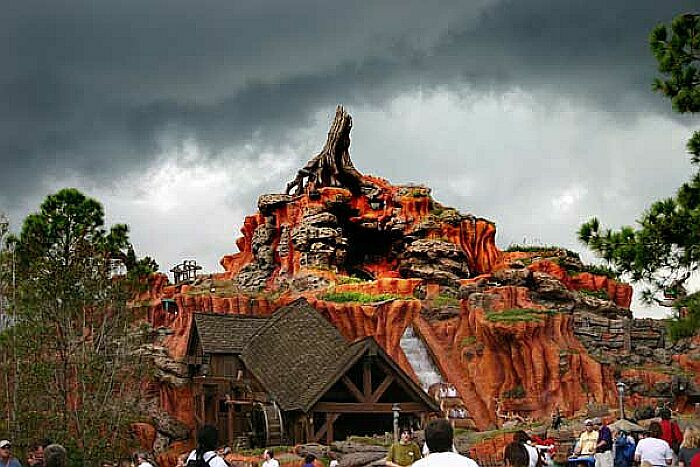 Big Thunder is next where it hammers it down with rain as we are under cover queuing. With our ever increasing luck it has stopped raining by the time we ride. Result. Tam is too cissy to ride Splash so we continue on into Adventureland to take a trip on Pirates. Unfortunately it is down, so we go back to Frontierland and jump on the train for a lap of the Magic Kingdom. The rain has made the seats wet and I alight from the train with a slightly moist bottom, which amuses the ladies for some reason. We head back to Pirates, but it is still down, so Main Street beckons for Deb to get her fill of shopping. The 3.00pm parade is just about to start, so I stand and watch with Tam. Its the first time Ive watched it completely and I guess its ok. As you can probably tell, Im not completely overwhelmed. We have done just about everything we want to do by this stage, so we exit and get the monorail to the Contemporary to find our rooms. We are in the North wing and have a sort of side view of Bay Lake. We were anticipating a car park view, so this exceeds our expectations. The décor is a little patterned and garish for my tastes, but the room is a good size and we are happy to be staying in a resort we would not normally try. With the luggage delivered it is time to try the delights of the Outer Rim. Tam decides this is vaguely rude and we all look at her with pity. We enjoy a couple of drinks while looking out of the window at Bay Lake. Conversation covers such diverse topics as the DIS, incontinence and Matts sexual prowess. I dont think the 3 are related and I dont think I should go into any further detail than that due to the delicacy of anyone that might be reading this. Back at the room we have showers and are out by 8.00pm for the evenings events. We are dining in the California Grill tonight and go to the desk on the second floor to check-in. They have changed the system here and you can only go to the California Grill if you have a PS. This seems a very sensible idea as it used to become packed with people going to look at the view and to see Wishes. They still dont seem to have got it quite right though as there are lots of people waiting for their tables and not enough seating to allow them all to wait in comfort. We grab drinks from the bar and chat away until our table is ready at 9.15pm. We are seated by the window, but at the far end of the restaurant and so cannot see the Magic Kingdom. Ron is our server and he says we should get up at any time to go out and watch Wishes. Not long after this the fireworks start and we go outside. Strangely, there is no music for a while, then suddenly the Thompson Twins begins to blare out from the speakers! This is all well and good, but I dont really want to hear this while watching Wishes. The fireworks are still beautiful and at the end of the display huge rockets explode all around the perimeter of the park, lighting up the whole area. I dont remember this before; I presume its a Christmas addition. We also notice that they no longer dim the lights in the restaurant. Ron says this is no longer done for safety reasons. Another example of the litigation society gone mad I suppose. We start our meal with the wild mushroom flat bread, which is lovely. For the appetizer Tam and I split the Fois Gras with date scone and sauce. It is very flavourful, but a little sweet for my liking. For the main course I have the pork tenderloin with goat cheese polenta and Tam has the braised lamb shank with apple cider sauce. Both are excellent. Desserts are taken by Tam and Deb. Tam has the citrus trio and Deb tries the butterscotch crème brulee. This is certainly not a cheap place to eat, with a bottle of wine and a decent tip for Ron the bill runs to $300 for the 4 of us. That said it is one of the best meals of our trip. Oh, I nearly forgot. Ron brought us all a glass of port for free. Good lad. We are back in the rooms and ready for bed around 11.30pm.